My mother accompanied me to a doll lecture several years ago to help set up the exhibit dolls. As a result of her “oohing and ahhing” over one of the reborn dolls included in the exhibit, I had an identical doll made for her. It was part of her birthday gift from me that year, which was 2004. 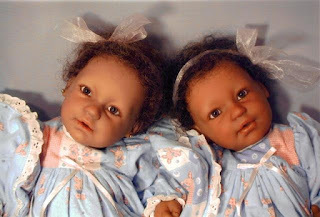 Reborn dolls have come a long way since then, but these two were nicely done, and my mother does not realize the progression of this doll art form. With Mother’s Day 2010 right around the corner, why not buy your mom, or someone else you hold near and dear, a doll for Mother’s Day? It does not have to be a reborn doll or an expensive doll, but lifesize baby dolls work best for those with maternal instincts whose nests have been empty for a while. Being a collector is not a prerequisite for the recipient to receive a doll as a gift (anytime of the year). My mother certainly is not a collector and, until now, never displayed any interest in dolls except those purchased for me and my younger sister when we were children. She loves Amberlynn as much as the collector in me loves Emberlynn. She enjoys changing Amberlynn’s outfits on a seasonal basis, too… so think doll, and think extra outfit for it as well. NextCollectible Quandary: Can You Collect When There’s Nothing There?